Heat oven to 400°F. Spray two 9-inch pie pans or one 13x9-inch pan with nonstick cooking spray. Remove dough from both cans. Unroll dough; starting at center, press out each dough rectangle with hands to form 12x8-inch rectangle. Cut each rectangle into 24 squares. In small bowl, combine oil and Italian seasoning; mix well. Drizzle over filled dough in pans. Sprinkle with Parmesan cheese. Bake at 400°F. for 16 to 22 minutes or until golden brown. Serve warm pizza bites with warm pizza sauce. Did you know there’s more you can make with pizza crust than just your average round, traditional pizza? Take these stuffed pizza bites, for example! This recipe takes all of the classic ingredients found in pizza and changes the game by slicing up Pillsbury pizza dough and shaping it into small balls around mozzarella cheese and pepperoni. Brush with Italian seasonings and Parmesan cheese, serve with a side of marinara, and you have your new favorite way to eat pizza! 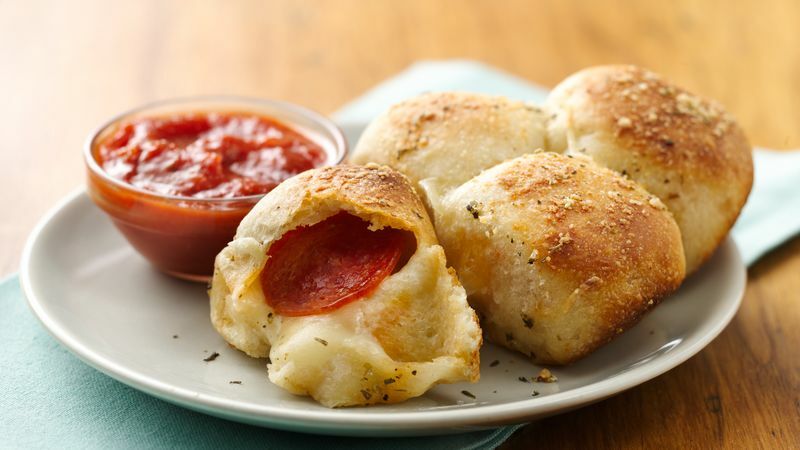 There’s a whole pizza world out there, and these stuffed crust pizza bites are just the start. We’re talkin’ pizza waffles, pizza casseroles and even pizza braids. Check them all out in our big pizza recipe collection, plus learn everything there is to know about making the perfect pizza at home in this handy article.